There have been surprisingly few galleries closing in the LES and Williamsburg. I asked several dealers why, and they guessed that most of the galleries have a relatively small nut and have always depended on other things besides art sales to survive. More galleries closed in Chelsea, but there are a lot more of them to begin with. So I don’t really know why there hasn’t been a gallery massacre. I suppose the true test will be how many re-open in the Fall. The other surprising thing is how many group shows there are now. Usually group shows take place in languid days of July when dealers let their director or assistant director curate a show, or the galleries test the market for artists they’re thinking of representing. Why there are so many now -- and so many really good ones -- I can’t explain. It can’t be the money because group shows hardly ever do as well as solo shows; and most of the time dealers have to split commissions on the work they do sell. It’s okay with me because I love summer group shows. I get a chance to see new artists and sometimes get a clue to future trends. The Smith-Stewart (53 Stanton Street) website says: Smith-Stewart will be closed for an extended summer (May 1-Aug. 31) and will re-open in a new space in September. Stay tuned.... but the gallery, according to its neighbors, is closed. On the other hand, after a long build-out, Michali Fine Art (45 Orchard Street) finally opened. Not a good trade-off I’m afraid. Judging from the bad lighting, chaotic installations, awkward space and general ineptness, Michali Fine Arts is a pretty amateurish operation. And, finally, Museum 52 moved to the other side of Houston, to 2 E. 2nd Street (and Bowery). I haven’t had a chance to check out the new space because it’s a bit out of the way, but more galleries are moving north of Houston (Zurcher Studio a few months ago). Guild & Greyshkul (28 Wooster Street ), founded by three enthusiastic young artists, Anya Kielar, Sara VanDerBeek, and Johannes VanDerBeek in September 2003, was the biggest loss. Nevertheless, some really good shows are currently in SoHo. One of them is at The Drawing Center 35 Wooster Street). 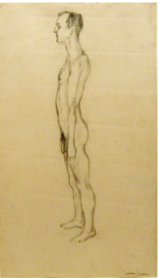 It's a major show of disturbing drawings by Unica Zurn done from the 1950’s until her suicide in 1970. She is known mainly as a writer associated with the Surrealists who suffered from a series of mental crises. The work is sometimes too painful to bear. Another good show is “Black & White Works,” Ronald Feldman (31 Mercer Street). This puts together work by thirty artists associated with the gallery since it was founded in 1971. And an impressive group it is, among them: Eleanor Antin, Joseph Beuys, Chris Burden, Leon Golub, Komar & Melamid, Roxy Paine, Andy Warhol and Hannah Wilke. The main closings I’m aware of are: Bellwether (134 Tenth Ave.), and Cohan & Leslie (138 10th Ave), both on the same unlucky block; and the Charles Cowles Gallery (537 W. 24th). There are probably more, and there certainly are plenty of rumors (see: http://howsmydealing.blogspot.com/). But even if I’m missing a few, that’s not bad considering how many galleries are in Chelsea now. Sadder for me is the closing of two of my favorite gallery shows of the year: “Pablo Picasso Mosqueteros” at Gagosian (of course!) and Sophie Calle at Paula Cooper, practically next door to each other. I came up with a great new routine for beginning a Chelsea gallery tour. I first check out Sperone Westwater (415 W. 13th), then have some great coffee (maybe with a little something) at Ninth Street Espresso in the Chelsea Market (it's near the middle of the market), then get on the beginning of the High Line and walk to the end at 20th Street. I might back-track a block or two to pick up a few galleries, but Chelsea pretty much begins at 20th Street. I guess it can be done in reverse, ending in the Meatpacking district, but I’ll want more than coffee at the end of a day in Chelsea! The biggest surprise for me was how many great shows are here currently. With about 40 galleries in the LES and more than 300 in Chelsea, I tend to forget about 57th Street. Big mistake! Tibor De Nagy (724 Fifth Ave. at 57th) has a museum-quality exhibition of Larry Rivers paintings from the 1950’s and early 60’s. I’m no fan of Rivers, but I forgot how strong that early work is. I think he had his head turned by Pop Art, and, as a result, his work took on an off-putting commercial illustrator tone. 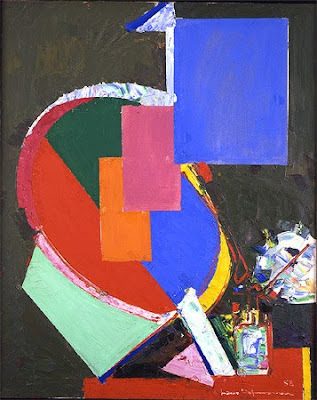 But this work has all the raw painterliness of late Abstract Expressionism without the tired mannerism of 10th Street Painting. It’ll be up until July 31st, and this show alone is worth the trip -- but there’s a lot more. In the same building is “Trees” at D. C. Moore -- thirty artists, spanning 150 years of interpretations of trees. Especially interesting was an early small painting by Alex Katz (I tend to prefer his small work which ironically I find more energetic than his big paintings), a 1964 Fairfeild Porter, and a knock-out large watercolor by Charles Burchfield. Marian Goodman (24 West 57th) is showing Yang Fudong’s hard-to-take video of wild dogs fighting for survival, and a visual assault of an installation in their front gallery. Yang Fudong is apparently one of China’s best known young artists, and, as unpleasant as this experience was, it’s powerful stuff. In the same building, by way of relief, is “Abstract Expressionism: Further Evidence” at Michael Rosenfeld (24 W. 57th) which has, among other major works, four large paintings from the 1950’s by Milton Resnick, Joan Mitchell, Hans Hoffman and Jack Tworkov. The matriarch of art galleries, Washburn (20 W. 57th) has new work by Jack Youngerman, but the really interesting stuff is photos by Diane Arbus in the back gallery. 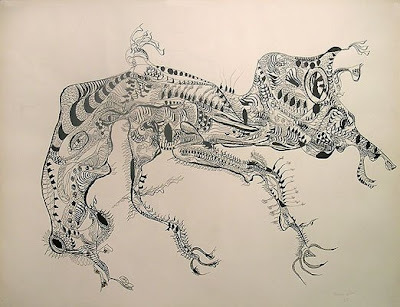 In the same building, the Franklin Parrasch Gallery is showing paintings and drawings by Joe Goode, sans milk bottles, from the 1960’s and 70’s. The Fuller building was a disappointment, but across the street, Pace (32 E. 57th) has a show of Tim Hawkinson. I loved his huge shows at Ace Gallery and the Whitney, and I liked this show too, but I think his droll act is starting to wear a bit thin. I’m afraid I’ve been negligent here. I missed what was probably a great show of Alice Neel’s nudes of the 1930’s at Zwirner & Wirth (32 E. 69th), but I saw John Chamberlain’s early work at L & M Arts (45 E. 78th). The car parts sculptures were no big deal (seen one...), but they have a few of his foam rubber pieces, and those really pushed the boundary of sculpture. And the omnipresent Gagosian had an unpublicized, offhand show of figurative work by the likes of Marcel Duchamp, Jeff Koons, Roy Lichtenstein, Man Ray, Gerhard Richter and Andy Warhol. Gago is such a show-off! Only two galleries closed, or appear to have closed, but TWO galleries opened! Slate Gallery (136 Wythe) and Black and White Gallery (483 Driggs) don’t have current shows, and unless they’re on some kind of hiatus (it happens! ), they’re gone. There was a rumor that Black and White was going to share a space with Bellwether, but Bellwether is definitely out of business; and there's another rumor that they are going non-profit -- but don’t they all say that? Let’s hope for the best because they are both really good galleries. The two new galleries are Gita Rosa (19 Hope Street) and Fleetwing Gallery (111 Grand Street). Actually Gita Rosa is re-opening -- they were on hiatus for a few months traveling (see -- it happens). Fleetwing is new, however, and there may be others -- I haven’t really done extensive research.